Premises for food value addition | Infonet Biovision Home. Short description: Includes recommended international code of practice, general principles of food hygiene, personal hygeine and premise sanitation. When planning to add value to food produced on the farm it is important to think of public health issues. A good business plan will aim to make the customers happy by producing clean, healthy, good tasting food attractively packed and labelled. In order to achieve this it is important to organise for good hygiene and a planned production aimed at a specific market, so that market requirements can be upheld easily. There are international standards that apply, and that it would be wise to be familiar with called codex alimentarius. In general speech that just means "general principles for good food hygiene". It is also possible and indeed recommended to get the premises certified to be following the HACCP system. HACCP is short for Hazard Analysis and Critical Control Point. Several companies in Kenya can assist with the internationally recognized HACCP certification, and if export is planned this is mandatory. Certification cost money, but a HACCP certification is a very good marketing tool. Customers are increasingly concerned about health issues. adopting practices and measures to ensure food is produced under appropriately hygienic conditions. Potential sources of contamination from the environment should be considered. In particular, primary food production should not be carried on in areas where the presence of potentially harmful substances would lead to an unacceptable level of such substances in food. The potential effects of primary production activities on the safety and suitability of food should be considered at all times. In particular, this includes identifying any specific points in such activities where a high probability of contamination may exist and taking specific measures to minimize that probability. The Hazard Analysis and Critical Control (HACCP) Point System based approach may assist in the taking of such measures. Producers should as far as practicable implement measures to: control contamination from air, soil, water, feedstuffs, fertilizers (including natural fertilizers), pesticides, veterinary drugs or any other agent used in primary production; control plant and animal health so that it does not pose a threat to human health through food consumption, or adversely affect the suitability of the product; and protect food sources from faecal and other contamination. In particular, care should be taken to manage wastes, and store harmful substances appropriately. On-farm programmes which achieve specific food safety goals are becoming an important part of primary production and should be encouraged. Procedures should be in place to: sort food and food ingredients to segregate material which is evidently unfit for human consumption; dispose of any rejected material in a hygienic manner; and Protect food and food ingredients from contamination by pests, or by chemical, physical or microbiological contaminants or other objectionable substances during handling, storage and transport. Care should be taken to prevent, so far as reasonably practicable, deterioration and spoilage through appropriate measures which may include controlling temperature, humidity, and/or other controls. Appropriate facilities and procedures should be in place to ensure that: any necessary cleaning and maintenance is carried out effectively; and an appropriate degree of personal hygiene is maintained. When planning WHERE and HOW to CONSTRUCT the value addition facility, it is important to plan for good hygienic design and construction. The position on the property also matters. It is for example advisable to place the facility away from dust, mud and flies and any other hazard that may be difficult to control. The design of the building should plan adequate access to incoming primary products, and make sure the outgoing finished products do not come into contact with the primary products (HACCP principle). Plan to clean the premises every day and for this reason place the facilities where good drainage of effluents is practical. there is effective protection against pest access and harbourage. Potential sources of contamination need to be considered when deciding where to locate food establishments, as well as the effectiveness of any reasonable measures that might be taken to protect food. Establishments should not be located anywhere where, after considering such protective measures, it is clear that there will remain a threat to food safety or suitability. In particular, establishments should normally be located away from: environmentally polluted areas and industrial activities which pose a serious threat of contaminating food; areas subject to flooding unless sufficient safeguards are provided; areas prone to infestations of pests; areas where wastes, either solid or liquid, cannot be removed effectively. 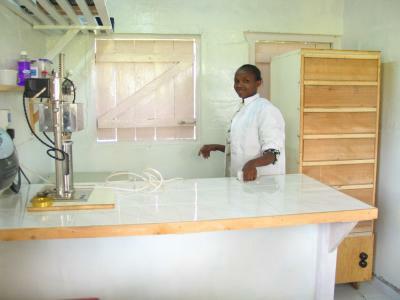 Facilitates good hygiene practices, including monitoring. Structures within food establishments should be soundly built of durable materials and be easy to maintain, clean and where appropriate, able to be disinfected. In particular the following specific conditions should be satisfied where necessary to protect the safety and suitability of food: the surfaces of walls, partitions and floors should be made of impervious materials with no toxic effect in intended use; walls and partitions should have a smooth surface up to a height appropriate to the operation; floors should be constructed to allow adequate drainage and cleaning; ceilings and overhead fixtures should be constructed and finished to minimize the build up of dirt and condensation, and the shedding of particles; windows should be easy to clean, be constructed to minimize the build up of dirt and where necessary, be fitted with removable and cleanable insect-proof screens. Where necessary, windows should be fixed; doors should have smooth, non-absorbent surfaces, and be easy to clean and, where necessary, disinfect; working surfaces that come into direct contact with food should be in sound condition, durable and easy to clean, maintain and disinfect. They should be made of smooth, non-absorbent materials, and inert to the food, to detergents and disinfectants under normal operating conditions. Premises and structures covered here include market stalls, mobile sales and street vending vehicles, temporary premises in which food is handled such as tents and marquees. Such premises and structures should be sited, designed and constructed to avoid, as far as reasonably practicable, contaminating food and harbouring pests. In applying these specific conditions and requirements, any food hygiene hazards associated with such facilities should be adequately controlled to ensure the safety and suitability of food. Equipment and containers (other than once-only use containers and packaging) coming into contact with food, should be designed and constructed to ensure that, where necessary, they can be adequately cleaned, disinfected and maintained to avoid the contamination of food. Equipment and containers should be made of materials with no toxic effect in intended use. Where necessary, equipment should be durable and movable or capable of being disassembled to allow for maintenance, cleaning, disinfection, monitoring and, for example, to facilitate inspection for pests. In addition to the general requirements, equipment used to cook, heat treat, cool, store or freeze food should be designed to achieve the required food temperatures as rapidly as necessary in the interests of food safety and suitability, and maintain them effectively. Such equipment should also be designed to allow temperatures to be monitored and controlled. Where necessary, such equipment should have effective means of controlling and monitoring humidity, air-flow and any other characteristic likely to have a detrimental effect on the safety or suitability of food. These requirements are intended to ensure that: harmful or undesirable micro-organisms or their toxins are eliminated or reduced to safe levels or their survival and growth are effectively controlled; where appropriate, critical limits established in HACCP-based plans can be monitored; and temperatures and other conditions necessary to food safety and suitability can be rapidly achieved and maintained. Containers for waste, by-products and inedible or dangerous substances, should be specifically identifiable, suitably constructed and, where appropriate, made of impervious material. Containers used to hold dangerous substances should be identified and, where appropriate, be lockable to prevent malicious or accidental contamination of food. An adequate supply of potable water with appropriate facilities for its storage, distribution and temperature control, should be available whenever necessary to ensure the safety and suitability of food. Potable water should be as specified in the latest edition of WHO Guidelines for Drinking Water Quality, or water of a higher standard. Non-potable water (for use in, for example, fire control, steam production, refrigeration and other similar purposes where it would not contaminate food), shall have a separate system. Non-potable water systems shall be identified and shall not connect with, or allow reflux into, potable water systems. Adequate drainage and waste disposal systems and facilities should be provided. They should be designed and constructed so that the risk of contaminating food or the potable water supply is avoided. Adequate facilities, suitably designated, should be provided for cleaning food, utensils and equipment. Such facilities should have an adequate supply of hot and cold potable water where appropriate. Personnel hygiene facilities should be available to ensure that an appropriate degree of personal hygiene can be maintained and to avoid contaminating food. Where appropriate, facilities should include: adequate means of hygienically washing and drying hands, including wash basins and a supply of hot and cold (or suitably temperature controlled) water; lavatories of appropriate hygienic design; and adequate changing facilities for personnel. Such facilities should be suitably located and designated. Depending on the nature of the food operations undertaken, adequate facilities should be available for heating, cooling, cooking, refrigerating and freezing food, for storing refrigerated or frozen foods, monitoring food temperatures, and when necessary, controlling ambient temperatures to ensure the safety and suitability of food. Adequate means of natural or mechanical ventilation should be provided, in particular to: minimize air-borne contamination of food, for example, from aerosols and condensation droplets; control ambient temperatures; control odours which might affect the suitability of food; and control humidity, where necessary, to ensure the safety and suitability of food. Ventilation systems should be designed and constructed so that air does not flow from contaminated areas to clean areas and, where necessary, they can be adequately maintained and cleaned. Adequate natural or artificial lighting should be provided to enable the undertaking to operate in a hygienic manner. Where necessary, lighting should not be such that the resulting colour is misleading. The intensity should be adequate to the nature of the operation. Lighting fixtures should, where appropriate, be protected to ensure that food is not contaminated by breakages. Where necessary, adequate facilities for the storage of food, ingredients and non-food chemicals (e.g. cleaning materials, lubricants, fuels) should be provided. Where appropriate, food storage facilities should be designed and constructed to: permit adequate maintenance and cleaning; avoid pest access and harbourage; enable food to be effectively protected from contamination during storage; and where necessary, provide an environment which minimizes the deterioration of food (e.g. by temperature and humidity control). The type of storage facilities required will depend on the nature of the food. Where necessary, separate, secure storage facilities for cleaning materials and hazardous substances should be provided. Control and supervision of food safety and hygiene in premises for value addition is extremely important in order to maintain customer satisfaction and approval of certifying institutions. Care should be taken to reduce the risk of unsafe food by taking preventive measures to assure the safety and suitability of food at an appropriate stage in the operation by controlling food hazards. designing, implementing, monitoring and reviewing effective control systems. review control procedures periodically, and whenever the operations change. These systems should be applied throughout the food chain to control food hygiene throughout the shelf-life of the product through proper product and process design. Control procedures may be simple, such as checking stock rotation calibrating equipment, or correctly loading refrigerated display units. In some cases a system based on expert advice, and involving documentation, may be appropriate. how the product is intended to be used, e.g. further cooking/processing or ready-to-eat. Such systems should also specify tolerable limits for time and temperature variations. Temperature recording devices should be checked at regular intervals and tested for accuracy. Management systems described thus far offer an effective way of ensuring the safety and suitability of food. Where microbiological, chemical or physical specifications are used in any food control system, such specifications should be based on sound scientific principles and state, where appropriate, monitoring procedures, analytical methods and action limits. Pathogens can be transferred from one food to another, either by direct contact or by food handlers, contact surfaces or the air. Raw, unprocessed food should be effectively separated, either physically or by time, from ready-to-eat foods, with effective intermediate cleaning and where appropriate disinfection. Access to processing areas may need to be restricted or controlled. Where risks are particularly high, access to processing areas should be only via a changing facility. Personnel may need to be required to put on clean protective clothing including footwear and wash their hands before entering. Surfaces, utensils, equipment, fixtures and fittings should be thoroughly cleaned and where necessary disinfected after raw food, particularly meat and poultry, has been handled or processed. Systems should be in place to prevent contamination of foods by foreign bodies such as glass or metal shards from machinery, dust, harmful fumes and unwanted chemicals. In manufacturing and processing, suitable detection or screening devices should be used where necessary. No raw material or ingredient should be accepted by an establishment if it is known to contain parasites, undesirable micro-organisms, pesticides, veterinary drugs or toxic, decomposed or extraneous substances which would not be reduced to an acceptable level by normal sorting and/or processing. Where appropriate, specifications for raw materials should be identified and applied. Raw materials or ingredients should, where appropriate, be inspected and sorted before processing. Where necessary, laboratory tests should be made to establish fitness for use. Only sound, suitable raw materials or ingredients should be used. Stocks of raw materials and ingredients should be subject to effective stock rotation. Packaging design and materials should provide adequate protection for products to minimize contamination, prevent damage, and accommodate proper labelling. Packaging materials or gases where used must be non-toxic and not pose a threat to the safety and suitability of food under the specified conditions of storage and use. Where appropriate, reusable packaging should be suitably durable, easy to clean and, where necessary disinfected. in certain food processes, e.g. chilling, and in food handling areas, provided this does not constitute a hazard to the safety and suitability of food (e.g. the use of clean sea water). Water recirculated for reuse should be treated and maintained in such a condition that no risk to the safety and suitability of food results from its use. The treatment process should be effectively monitored. Recirculated water which has received no further treatment and water recovered from processing of food by evaporation or drying may be used, provided its use does not constitute a risk to the safety and suitability of food. Potable water should be used wherever necessary to avoid food contamination. Ice should be made from potable water that complies with WHO Guidelines for Drinking Water Quality or water of a higher standard. Ice and steam should be produced, handled and stored to protect them from contamination. Steam used in direct contact with food or food contact surfaces should not constitute a threat to the safety and suitability of food. The type of control and supervision needed will depend on the size of the business, the nature of its activities and the types of food involved. Managers and supervisors should have enough knowledge of food hygiene principles and practices to be able to judge potential risks, take appropriate preventive and corrective action, and ensure that effective monitoring and supervision takes place. Where necessary, appropriate records of processing, production and distribution should be kept and retained for a period that exceeds the shelf-life of the product. Documentation can enhance the credibility and effectiveness of the food safety control system. Managers should ensure effective procedures are in place to deal with any food safety hazard and to enable the complete, rapid recall of any implicated lot of the finished food from the market. Where a product has been withdrawn because of an immediate health hazard, other products which are produced under similar conditions, and which may present a similar hazard to public health, should be evaluated for safety and may need to be withdrawn. The need for public warnings should be considered. Recalled products should be held under supervision until they are destroyed, used for purposes other than human consumption, determined to be safe for human consumption, or reprocessed in a manner to ensure their safety. When planning the value addition production system it is necessary also to plan for maintenance and sanitation. What to do if a rat moves in? etc. The building should be designed in a way that it does not provide good hiding places for pests. It should also have as few corners and narrow spaces as possible so that proper cleaning can reach everywhere. Also plan a special store for cleaning materials to make sure they do not contaminate the food by accident. monitor effectiveness of maintenance and sanitation procedures. prevent contamination of food, e.g. from metal shards, flaking plaster, debris and chemicals. Cleaning should remove food residues and dirt which may be a source of contamination. The necessary cleaning methods and materials will depend on the nature of the food business. Disinfection may be necessary after cleaning. Cleaning chemicals should be handled and used carefully and in accordance with manufacturers instructions and stored, where necessary, separated from food, in clearly identified containers to avoid the risk of contaminating food. where necessary, disinfection with subsequent rinsing unless the manufacturers? instructions indicate on scientific basis that rinsing is not required. Pests pose a major threat to the safety and suitability of food. Pest infestations can occur where there are breeding sites and a supply of food. Good hygiene practices should be employed to avoid creating an environment conducive to pests. Good sanitation, inspection of incoming materials and good monitoring can minimize the likelihood of infestation and thereby limit the need for pesticides. Buildings should be kept in good repair and condition to prevent pest access and to eliminate potential breeding sites. Holes, drains and other places where pests are likely to gain access should be kept sealed. Wire mesh screens, for example on open windows, doors and ventilators, will reduce the problem of pest entry. Animals should, wherever possible, be excluded from the grounds of factories and food processing plants. The availability of food and water encourages pest harbourage and infestation. Potential food sources should be stored in pest-proof containers and/or stacked above the ground and away from walls. Areas both inside and outside food premises should be kept clean. Where appropriate,refuse should be stored in covered, pest-proof containers. Establishments and surrounding areas should be regularly examined for evidence of infestation. Pest infestations should be dealt with immediately and without adversely affecting food safety or suitability. Treatment with chemical, physical or biological agents should be carried out without posing a threat to the safety or suitability of food. Suitable provision must be made for the removal and storage of waste. Waste must not be allowed to accumulate in food handling, food storage, and other working areas and the adjoining environment except so far as is unavoidable for the proper functioning of the business. Waste stores must be kept appropriately clean. Sanitation systems should be monitored for effectiveness, periodically verified by means such as audit pre-operational inspections or, where appropriate, microbiological sampling of environment and food contact surfaces and regularly reviewed and adapted to reflect changed circumstances. behaving and operating in an appropriate manner. People known, or suspected, to be suffering from, or to be a carrier of a disease or illness likely to be transmitted through food, should not be allowed to enter any food handling area if there is a likelihood of their contaminating food. Any person so affected should immediately report illness or symptoms of illness to the management. Medical examination of a food handler should be carried out if clinically or epidemiologically indicated. discharges from the ear, eye or nose. after handling raw food or any contaminated material, where this could result in contamination of other food items; they should avoid handling ready-to-eat food, where appropriate. sneezing or coughing over unprotected food. Personal effects such as jewellery, watches, pins or other items should not be worn or brought into food handling areas if they pose a threat to the safety and suitability of food. Food items can also become contaminated during transport and reach the destination spoiled. This is not only a financial loss and waste of time, but if sold in spite of this can cause serious problems. provide an environment which effectively controls the growth of pathogenic or spoilage micro-organisms and the production of toxins in food. Food must be adequately protected during transport. The type of conveyances or containers required depends on the nature of the food and the conditions under which it has to be transported. allow any necessary temperature, humidity and other conditions to be checked. Conveyances and containers for transporting food should be kept in an appropriate state of cleanliness, repair and condition. Where the same conveyance or container is used for transporting different foods, or non-foods, effective cleaning and, where necessary, disinfection should take place between loads. Where appropriate, particularly in bulk transport, containers and conveyances should be designated and marked for food use only and be used only for that purpose. All products brought to market must have good product information such as how to store the product (example: "Refrigerate after opening" ) and even how to use it. Insufficient product information, and/or inadequate knowledge of general food hygiene, can lead to products being mishandled at later stages in the food chain. Such mishandling can result in illness, or products becoming unsuitable for consumption, even where adequate hygiene control measures have been taken earlier in the food chain. prevent contamination and growth or survival of food borne pathogens by storing, preparing and using it correctly. Information for industry or trade users should be clearly distinguishable from consumer information, particularly on food labels. Lot identification is essential in product recall and also helps effective stock rotation. Each container of food should be permanently marked to identify the producer and the lot. Codex General Standard for the Labelling of Prepackaged Foods (CODEX STAN 1-1985, Rev. 1(1991)) applies. All food products should be accompanied by or bear adequate information to enable the next person in the food chain to handle, display, store and prepare and use the product safely and correctly. Prepackaged foods should be labelled with clear instructions to enable the next person in the food chain to handle, display, store and use the product safely. Codex General Standard for the Labelling of Prepackaged Foods (CODEX STAN 1-1985, Rev. (1991)) applies. Health education programmes should cover general food hygiene. Such programmes should enable consumers to understand the importance of any product information and to follow any instructions accompanying products, and make informed choices. In particular consumers should be informed of the relationship between time/temperature control and foodborne illness. Training is fundamentally important to any food hygiene system. Inadequate hygiene training, and/or instruction and supervision of all people involved in food related activities pose a potential threat to the safety of food and its suitability for consumption. Those engaged in food operations who come directly or indirectly into contact with food should be trained, and/or instructed in food hygiene to a level appropriate to the operations they are to perform. Food hygiene training is fundamentally important. All personnel should be aware of their role and responsibility in protecting food from contamination or deterioration. Food handlers should have the necessary knowledge and skills to enable them to handle food hygienically. Those who handle strong cleaning chemicals or other potentially hazardous chemicals should be instructed in safe handling techniques. the expected length of time before consumption. Periodic assessments of the effectiveness of training and instruction programmes should be made, as well as routine supervision and checks to ensure that procedures are being carried out effectively. Managers and supervisors of food processes should have the necessary knowledge of food hygiene principles and practices to be able to judge potential risks and take the necessary action to remedy deficiencies. Training programmes should be routinely reviewed and updated where necessary. Systems should be in place to ensure that food handlers remain aware of all procedures necessary to maintain the safety and suitability of food.